Item # 310091 Stash Points: 4,499 (?) This is the number of points you get in The Zumiez Stash for purchasing this item. Stash points are redeemable for exclusive rewards only available to Zumiez Stash members. To redeem your points check out the rewards catalog on thestash.zumiez.com. Step up your skate deck durability on the Almost Skateistan 7.75" Skateboard Deck. This thin and lively board features Almost's infamous single press construction to maximize durability while the mild concave throughout provides stability on this board's smaller size. Coming in a traditional popsicle shape with a more pitched nose than tail, this deck will also help drive powerful pop on regular tricks while providing ease of flick flip tricks on it's more upturned nose. 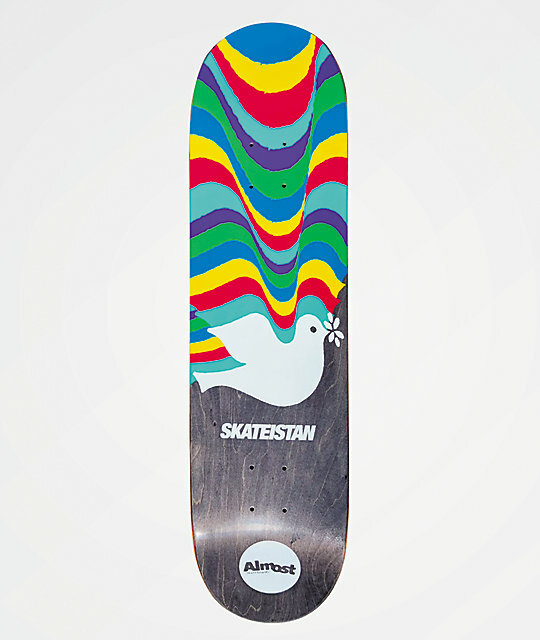 Progress your riding with a Almost Skateistan 7.75" Skateboard Deck. Skateistan 7.75" Skateboard Deck from Almost Skateboards.